As you may already know, I am a big fan of the BBC drama, The A Word all about a family dealing with their little boy’s autism. As an autism family myself I like to use the drama to reflect how it has represented my experiences with Autism. I’ve not written for a few weeks, partly because the drama has followed so many different paths to the autism one and partly because I’ve not really had the time to analyse the episodes. I have decided to write this post though as I now have another reason to write about it. All will be revealed in a moment. I’ve chosen the title ticking boxes because any parent of a child with autism or any disabilities or learning difficulties will know the relevance. In the A Word we see the family struggling to fill in a form for their autistic boy Joe’s new school. Form filling is something we special needs parents know all about, whether it’s for schools, for assessments or even for benefits for our children. There are forms galore and many of them pages and pages long. It doesn’t stop either. In a later episode we see an older autistic boy, Mark, filling in a form for college. He read out a part of the form he’d written himself, about himself and it made me cry. A small insight into how an autistic teenager feels about trying to fit in with others. When your child is first expected to have autism then it’s forms that come first. Tick the boxes, fit the structure, get the diagnosis. Only, it’s not so easy, what if your child doesn’t fit? What if you can’t tick the boxes? This is the situation I find myself in right now, yet again, for the third time. My youngest, my Little Man has been having problems at school and after a meeting with his teacher the other day, she has suggested that we see about getting him assessed for autism. I can’t say I’ve never thought about it but he just doesn’t tick the boxes. But, no autistic child is the same so even though I have two already it’s still possible to have a third that’s totally different. The thing is, in my heart, I really don’t think he has autism, I think maybe he has an Attention Deficit Disorder. I guess the only way to find out is to get him assessed and that’s probably what we need to get started on. Both my eldest and Star were different from birth, they didn’t sleep, they didn’t settle, they were mostly unhappy. Then they didn’t fit in with other children, they didn’t play the same way. They were both vocal but difficult to converse with. They both had echolia and vacant episodes. They both had trouble at school which led to them being assessed. They both ticked many of the boxes for autism…yet, they are not very much alike, they are very different characters. He didn’t walk until he was nearly two years old and then he just ran everywhere, the phrase ‘you can’t run until you can walk’ had little meaning to him. He was also a slow speaker. The health visitor suggested that we sent him to a pre-school group for two and half days a week. He was only two and would be all day for two days, meaning he had lunch there as well. It was a difficult decision for me as I’d cared for all my children until they were old enough for nursery, he was still a baby to me. But, it did him good, he soon caught up with all his peers and he even toilet trained while there. Despite his slow start he has come along really well and is bright, lively and very loving. He cares about everyone and loves to cuddle. Something my older autistic children have never been keen to do. (Although my eldest does have his own way of hugging me and does so frequently.) He’s always had loads of friends and everyone has seemed to like him….until recently. Suddenly the children he has been at school with for the last four years have turned against him. His friendship list has dwindled massively. A couple of his close friends have now moved to different schools which may have started the disruption but it’s hard to tell, he doesn’t tell us much. He has started being very naughty in class, drawing on walls, desks and chairs, tripping up other children, flooding the toilets and more. Has has zero patience and limited concentration. This continues at home which is why I think he has ADD. However, he is also a child in a different kind of home with autistic siblings and a disabled mother. He has very limited memories of when I could walk. It must all be very tough on a seven year old. I really don’t think he ticks the boxes, but let’s bring it on. I’m ready for more forms. Another point that was brought up in The A Word was whether you would change an autistic child, or wish for them to not be autistic anymore. I don’t mean a cure, but just wish they hadn’t been born that way. This is such a tricky subject and I’m so glad they were brave enough to mention it. Their little boy is different from other children and they face a future with him that they didn’t expect and one that no-one would really wish for. But, if they took away the autism would the child be the same child or would it be like swapping them for a different child? There is so much about autism that is not bad, an autistic person can be very loyal and truthful. The autism becomes part of their personality and with all the awareness these days I’m sure life will be better for them in the future. I can see autistic people fitting into jobs, marriages and leading a relatively normal life, in fact many have already. Then there are those that are on the higher end of the spectrum that will never lead a ‘normal’ life. It’s so difficult, because taking away the autism is taking away part of the child. No-one wants an autistic child, but once they are in the family everything changes and whether it’s for better or worse the only thing I know for sure is that everyone is different. The BBC drama, The A Word, is back on for it’s second series. I really enjoyed the first series and blogged after at lot of the episodes as I have two Autistic children myself. The A Word is a drama, not a documentary, it may resonate with parents of autistic children, but probably not with all of them. It also has plenty of story for drama lovers who do not know anyone with autism. The best thing about The A Word is that it brings more awareness for Autism which can be a good thing. Many years ago Autism was a condition that was hidden away, it was under diagnosed as parents covered up their child’s differences and labelled them as difficult rather than disabled. I almost fell into that category myself which is why my eldest was not officially diagnosed until he was twelve years old. Having a diagnosis opens up the doors for treatment and help but it’s never been easy. I think this is where the drama, The A Word, will explore next. This is something which will resonate with most parents of Autistic Children, whether they can compare their child to the child in the drama or not. 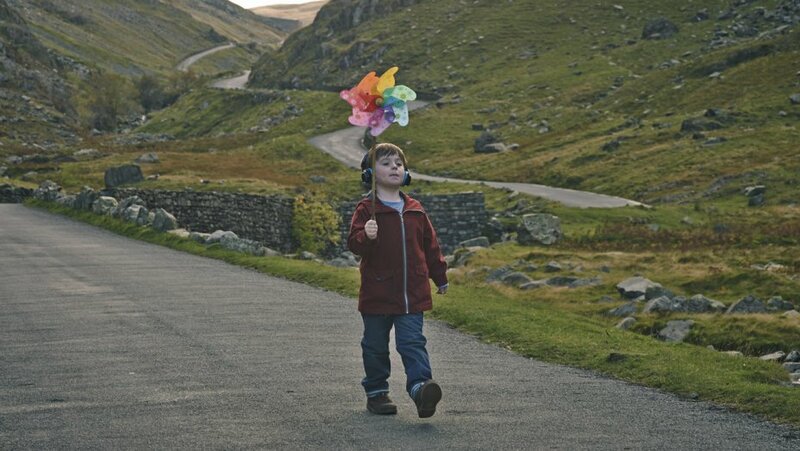 The A Word focuses on the family lives surrounding Joe, a seven year old Autistic boy and his parents, Alison and Paul. In the last series we saw Joe getting his diagnosis and his mum finding it difficult to accept, she wanted treatment and cures, she wanted to do all she could to make him ‘well’ again. Of course, this is not possible, Autism is a life long condition. You can see improvements, all kids grow and mature and this is true of most Autistic kids too. The spectrum of Autism is huge and even though it’s a cliche it’s true when they say that ‘when you meet one child with Autism, you meet one child with Autism.’ I have two children with Autism and they are both different, they have their similarities too. The first episode of the second series of The A Word, shows a more accepting family. Two years on they have accepted Joe for the sum of all his parts, including his Autism and now are trying to make others accept him too. In particular his school, where Mum, Alison, talks to the other parents about Joe, explaining that he is different and that the children should accept that some children may be different which will pave the way for more accepting adults in the future. This doesn’t seem to go down too well though and Alison and Paul have decided to move Joe to a school which understands his needs. This is something that many parents of Autistic Children find extremely difficult so it’s a great topic to explore. Also, in this first episode, Alison and Paul realise that Joe is also beginning to understand that he is different and they decide to talk to him about Autism. This is something that most Parents of Autistic Children will face at some point. It depends mostly on the severity of the Autism and the acceptance of the family to their child’s Autism. With my eldest I had no idea why he was the way he was. I never questioned why he was different and tried to make him behave the same as the other children, I encouraged him to have lots of friends and our home was usually full of little faces. I pushed to the back of my mind his lack of interaction with these children, in my head he had loads of friends. I knew he was clever at school, even if he was disruptive and ‘naughty’ at times. I put it down to him being so clever he got bored easily. In my mind, if he was clever, then there couldn’t be anything wrong with him. When I finally admitted that something could be wrong I took him to see the GP, where at 10 years old he kept dragging the chair around the room while I was trying to speak, or sat upside down making silly noises. The GP said I was depressed and gave me some pills. My son laughed at me all the way home. At twelve years, we finally got to see a psychologist, who decided, as he sat in the corner eating the sole of his shoes, that he was, in fact, on the Autistic spectrum. He was old enough and clever enough to understand that he had been diagnosed so I never had the problem of when to tell him. My younger daughter was just six years old when she was diagnosed. I had known from birth, it’s one of those things that if you’ve been through once, you just know. I didn’t do anything about it until other people started noticing. I wasn’t sure if it was just me or if indeed she was Autistic. I didn’t want her to be Autistic, I wanted to be wrong, so waiting for someone else to point it out was, in my mind, the only way to be sure. We went along for the assessments and the diagnosis was pretty quick. But, because she was so young there had to become a time when we had to tell her. I really can’t remember a specific time of sitting her down and telling her she was Autistic. I think we just mentioned it casually and answered questions as needed. Her teachers needed to be told and they talked about it with her too. She has had good experiences with her schools which has been a relief. My biggest worry was her transition to Secondary School but she has managed really well because her school is good, they understand Autism and have everything in place to help her. I am pleased that she is coping in mainstream school and I really hope it continues. We already know there are very little options otherwise. Raising awareness of Autism is a good thing, getting people to talk about it is great. For too long people have had misconceptions about Autism and even been afraid of it, now it’s time for understanding and acceptance, Autism isn’t going to go away and it’s something that could suddenly appear in anyone’s family. No-one is immune. The A Word is helping to raise that awareness by portraying Autism in a family setting, with lots of other family drama going on around it. Even if you don’t like the story line or the characters you must surely enjoy the gorgeous views of the Lake District! Have you seen The A Word? What did you think of it, has it made you more aware of Autism? If you have an Autistic Child when did you tell them they were Autistic, or why haven’t you told them? I love to praise my kids and this week they deserve a mention. First lets start with the Little Man. He’s had a struggle since being at school, I’ve found, having three Summer babies, that starting school can be difficult because they are younger than most of their peers. The Little Man was immature, but he’s also pretty clever which is quite a mix. His behaviour hasn’t been good, but his work has. Yesterday it was his parents evening and the teacher was full of praise. Over the last term he has calmed down a lot, his behaviour has improved considerably and he’s settling down to do his work. His work has been fantastic with him being in the top group of the class for all his subjects, although he does need to work on his writing a little. He’s six years old, I’m sure his writing will improve. I am so proud of him. I’ll be even prouder on Friday as we have been invited to the school to see him receive a certificate in assembly. It’s not been plain sailing with him. He was referred to the school nurse because of his behaviour and a few other issues. He has hyper mobile joints just like his sister which means he gets some pain and could also be the reason why he has trouble with his writing as his fingers are hyper mobile too. (Most members of our family have some hyper mobility issues.) The nurse has decided that he needs a few sessions of one to one as he has some emotional issues. One of which is that he is not dealing very well with me being ill. He really wants to know when I will get better, but he hasn’t asked me or his Dad. We have tried to talk to all the kids but it’s hard when we don’t even know ourselves what is going to happen. Hopefully these sessions will help him. Last week we had to attend an assembly to see Boo receive a certificate in assembly for Engagement in her lessons. She’s doing really well at school and we’ve never had any problems with her. I will always be proud of my sweet Boo. Then there is Star, who is about to undergo a huge change as she will break up for an extended Easter holiday next week, and when she goes back her school will be in a new building. Yesterday she came home really happy because she’d been for a tour of the new building. She was one of a selected few and had a special pass made for her. She was chosen as group who find change difficult, so the school is trying to recognise the needs of it’s Autistic children. I’m glad that she’s taking this all so well. I’m linking up with Jane over on Our Little Escapades, click the badge to see other proud parents. I gave up doing the lottery a long time, I don’t really have any dreams of being rich. A few years ago if I’d been asked what I would do if I won the lottery I’d have said the usual, buy a bigger house, go on lots of holidays, see the world, make sure my children have plenty for the future. I’m not so sure now. Of course I’d like to see my children financially safe, I’ve never really had loads of money and I know what it’s like to struggle. I don’t want my children to struggle of course, but I would like them to earn their money rather than have it dropped in their laps. I’d like them to learn how to budget and save, they are important skills that would disappear if they had everything they wanted. As for the house, well three years ago there was seven of us squished into a tiny three bedroomed house. Now we have a lovely five bedroomed house which more than fits our needs. Of course I am struggling to get it looking as nice as I would like, I’d like to be able to finish my decorating to a nice standard and be surrounded by nice things. I’d like the garden to have lots of nice things for the kids to play on and lots of plants and flowers for me. The sort of things that having a lot of money would make a big difference, but not necessities and things we can live without if we have to. Holidays are something I love but I’ve never been abroad. I’m not a sun seeker, in fact the sun really doesn’t agree with me. There are places I’d like to see in the world and I’d love for my children to travel more. However, I’m also scared of the things going on in the world and even my close family have had close misses. My daughter was at Belgium airport shortly before the bombings and my Brother was in Turkey shortly before the bombings…literally just a couple of weeks could have been a big loss to my family. I know that you shouldn’t let these things scare you, but it does me, particularly as I’m not a big traveller anyway. So, what would I spend my lottery win on? I would build a Free School for high functioning Autistic Children. The kind of kids that do not belong in a special school and struggle in a mainstream school. My son lasted just a year and half in mainstream secondary school and my daughter has just started her first year. It’s not easy for them, they try to fit in but know they are different. They are targets for bullies, they find it difficult to make or keep friendships. They find it hard to keep up with the work and follow all the rules. They don’t understand when they are punished for not doing the work, or not being in the right place, or not being quiet when they are asked. They feel lost and afraid and incredibly anxious. They may make friends and do well academically, but these kids don’t fit in and struggle every day. My dream would be to provide a school for my daughter and other kids like her to make their school years productive and happy. I would make sure that the teachers knew everything about Autism and knew that these children had different needs. These children deserve a decent education and deserve to be happy. Maybe I will start buying a ticket! This is my post for Day 3 of Blogtober16, please click the image below to see what others would do if they won the lottery.